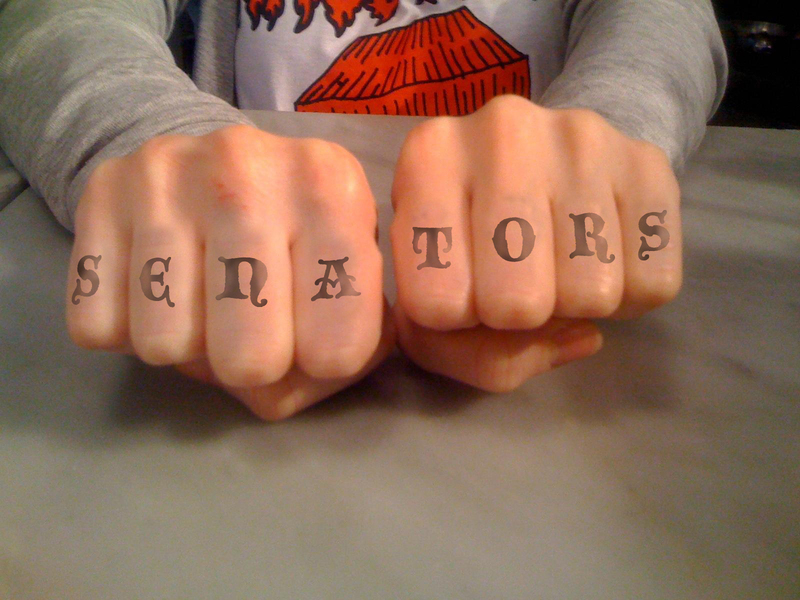 We here at The Review applaud those fans who go to such lengths as to individually apply knuckle tattoos (real or virtual) in honor of a team currently 0-for-14 on the powerplay. I’m going to get J-A-R-K-O R-U-U-T-U on mine (including thumbs) and then punch a leafs fan in the junk. (3-0 is their best start since ’99!) Or O-L-E-G(‘s) I-P-O-D, in honor of Oleg Saprykin, who, by the way, was drafted 11th overall back in 1999. That’s looney. In other news, Ottawa has a game against Carolina tonight. TSN will be good enough to show it nationwide rather than a CFL borefest between the Thunderbay Thunder Riders and the North Bay Rider Bats. I predict that Joe Corvo scores 14 goals but finishes -3.